THE Z AXIS MMS MAY 2018 18 mmsonline.com pzelinski@mmsonline.com Peter Zelinski EDITOR-IN-CHIEF @Z_Axis_MMS Why Does Quoted Pricing Vary So Much from Shop to Shop? I recently assisted in a project conducted by Gardner Intelligence, the research group within Modern Machine Shop publisher Gardner Business Media, which involved analyzing the machining costs of various part types. I asked several shops to provide quotes on certain parts, and thus encountered the predicament that buyers of machined parts routinely see: a wide range of prices. There is no simple answer to the question, "How much does it cost to machine this part?" MakeTime has seen the same thing. 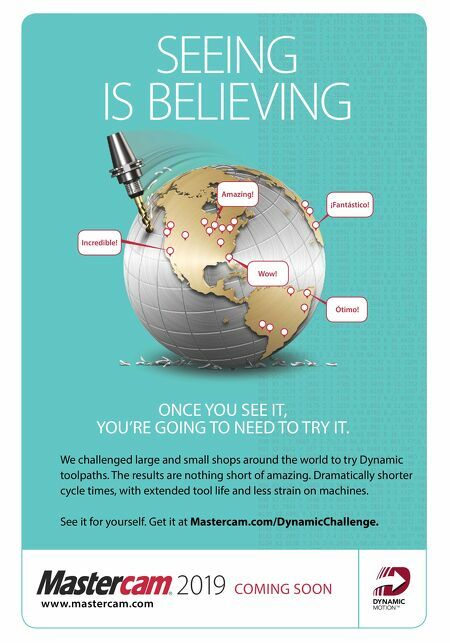 This company, which is in the business of matching shops with customers, cites research finding a factor-of-10 discrepancy in quoted prices for iden- tical machining work. Aiming to simplify costing, the company recently introduced a "network pric- ing" feature that can estimate a part's machining cost based on MakeTime's history and analysis of the costing of similar parts. I recently asked MakeTime Director of Fulfill- ment Justin Hosley about the pricing discrepancy. Having previously worked in business devel- opment for a machine shop, he holds the view that there is no single explanation, but instead a variety of factors. His list is below, followed by a few additions of mine. Why do shops' prices differ widely? Here are some reasons: 1. Capabilities. Many shops could make the part to print, but not all would employ equally sophis- ticated resources. The difference between five- axis machining and many setups on a simple mill affects price. So does the presence of in-house grinding rather than outsourcing this work. 2. Capacity. Busy shops bid higher. (Since MakeTime's pricing model is based on current open capacity, it sees this variation every day.) 3. Interpretation. Two shops can interpret the same job differently. The one that knows the customer well might know that some details of the print do not matter. The new supplier does not know what to ignore. 4. Regionality. The presence of certain industries in a region bids up the local price. A shop in a rural area might comfortably quote a lower price than a shop in an area full of aerospace suppliers. 5. Automation. On higher-volume jobs, differences in labor costs affect pricing substantially. 6. Process. The experienced or clever engineer or machinist might see a more efficient way to set up or run the job than other bidders. 7. Relationships. Mr. Hosley has experienced this one. The 60-year-old shop he worked for could get better pricing on material than other, newer shops. That is his list. I will add three more of my own: 8. Envelope. A given shop frequently is best adapted to run parts within a given size range, whether large or small. Competitively running parts outside this scale is difficult. 9. Qualification. If a shop has the assets qualifying it for a specific industry—think auditing staff, special machines or inspection capabilities—then it seeks to cover the cost of these assets even in work out- side of that industry. 10. Error. Shops make mistakes in their quoting. Sometimes the reason behind a low bid is as simple as this. In these cases, the shop is lucky if it does not win the job. 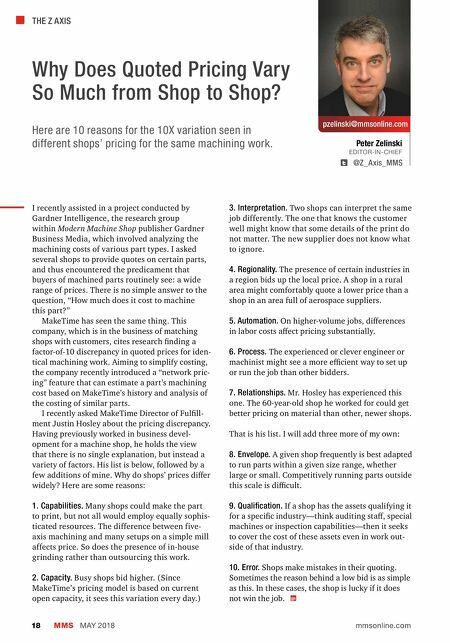 Here are 10 reasons for the 10X variation seen in different shops' pricing for the same machining work.